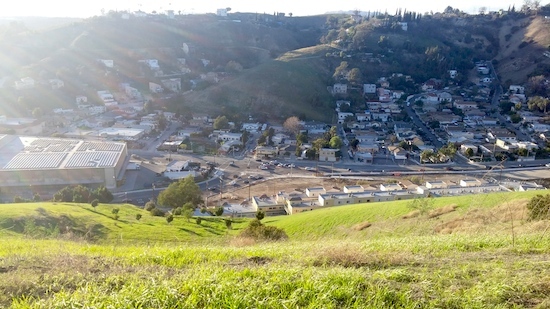 Whenever there's more to the story, there's always a sequel (although these days it's only because the movie studios want to make more money), but after The Militant's recent little Eastside trek to El Sereno (and adjacent), he was inspired to check out the neato little verdant rolling hills east of Soto Street. 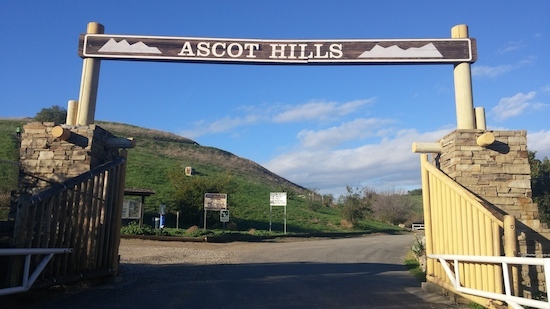 Back in the 1920s, the area was home to a racing venue called the Legion Ascot Speedway, which attracted Angelenos from far and wide (this was still a couple decades before the Los Angeles Rams brought big-league professional team sports to town). Finally opened in June, 2011, some 81 years before it was supposed to open. The Militant was welcomed by a brown dirt path cutting through the mountain and leading up at a steep angle. He was concerned with not having the proper hiking gear, until he looked down at his feet and realized that his combat boots could function perfectly well as hiking shoes (A true Militant is always at the ready). So he walked up the path, rounded a hill and walked westward. 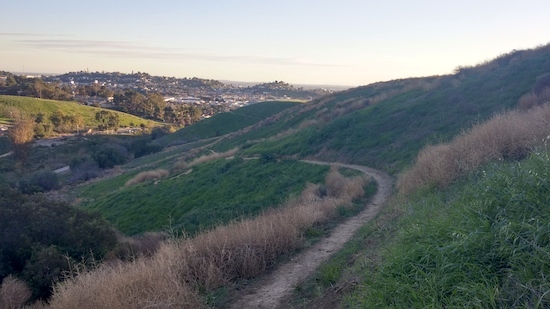 he was greeted by an awesome view of not only the Downtown Los Angeles skyline, but of the Palos Verdes Peninsula, and even Catalina Island behind that. 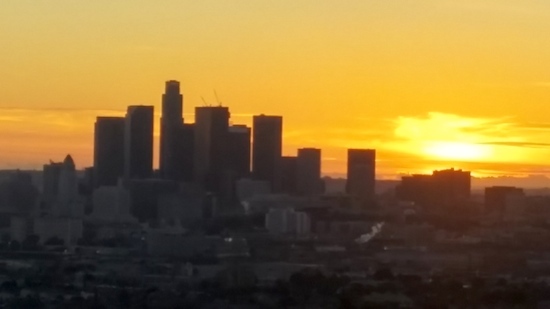 The Hollywood Sign and the outline of the Century City skyline can also be seen. To the north were the San Gabriel Mountains, including the snowcapped (yet overcast) Mt. Baldy. To the southeast he could also see Orange County's Saddleback Mountain in clear view. 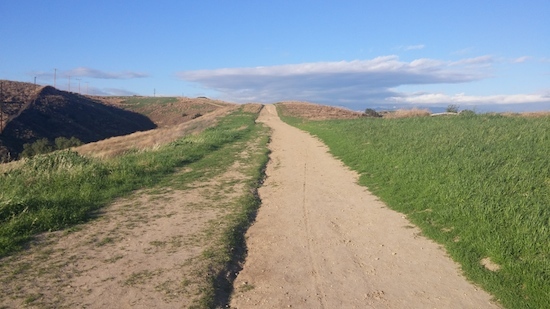 This place is like the Eastside's Runyon Canyon -- except for the absence of the superficial self-centered showbiz (SSS) types and the lack of dog crap. And considering that he saw about 5 dogs being walked along his hike, he can say that Eastsiders are gar more responsible people. 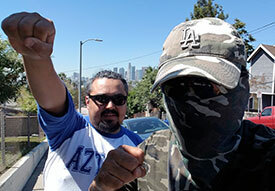 The Militant also looked down towards nearby Montecito Heights where he could see the site of the now-removed Pacific Electric viaduct (R.I.P.). 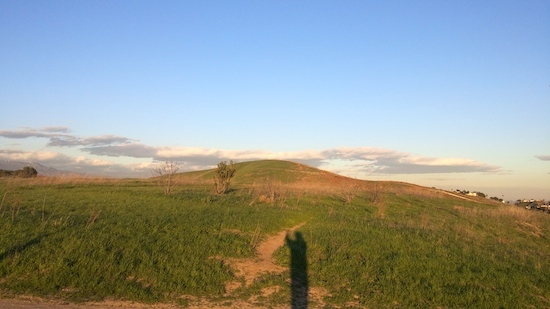 The best part, however, was The Militant hanging out there in the Ascot Hills, waiting for the sun to go down. And although this was a generally cloudless sunset (and thus not an #epicsunset that fills up Twitter and Instragram feeds), it was nonetheless awesome. Do make a chance to get here before Springtime ends; the hills are nice and green and native wildfllowers are known to grow here! Thanks for bringing back memories. I remember riding my bicycle into those hills back in the late '40s and early '50s. Amazing to learn there are still spaces like that left in the LA Basin.